We do what’s right for kids. 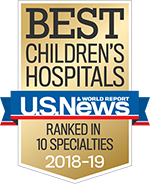 St. Louis Children’s Hospital is a not-for-profit hospital that enlists the charitable support of a growing community of donors to become Guardians of Childhood. Join us. Stories of support, discovery and outreach. Table Tops Spring Event is one-of-a-kind luncheon with very elaborate table tops created by local designers. You support the highest levels of patient and family-centered care in every medical specialty and subspecialty. You keep kids out of the hospital through health outreach, screenings, safety and violence prevention programs. You support critical pediatric research bringing personalized medicine from bench to bedside.